As summer winds down, memories of past years; vacations and other memories have been rolling through my mind. Below is a slightly revised version of a blog which ran on this site five years ago. The subject is one near and dear to the hearts of Bridgeport residents; past and present: The Fireman's Fair. Photos are courtesy of Richard Duez and have been featured in his "Time Travel" blog over the years. In chatting recently with a couple of my high school gal pals, the subject of the Fireman’s Fair came up. The three of us happened to be majorettes back in the day – during the mid- to late-1970s. We were among those who took turns sitting on the dunk tank, located just beside the fire station. People – mostly high school boys – would pay a dollar or so and get a bucket of baseballs to throw. The object, of course, was to hit that magic button inside the dunking booth and watch the sitting girl take a plunge. If they tried enough times and still had no luck hitting the button, the person manning the game would many times just let them go push the darn thing. Even in the midst of summertime, the evenings were sometimes chilly. So between our shifts, we’d bundle up in oversized firemen coats – the ones with all the buckles. We would egg the throwers on – implying that they didn’t have it in them; calling them candy arm and such. As we were reminiscing about the experience, we talked about how, to this day, the sound of a hard ball hitting the wooden surface of a dunking booth still makes us jump. That, of course, is not the only lasting memory of the famed Fireman’s Fair. It was an annual event in the city, a fundraiser for the Bridgeport Volunteer Fire Department. The whole town supported the event, which was a lot of fun. Come fair time, you could bet your boots that Main Street was packed with folks walking to the fairgrounds. They would come to play bingo in the firehouse or Keno, which was set up under a tent just outside. Once in a while someone would win big, but they would play for hours regardless. Fair enthusiasts also flocked for carnival ride thrills. There was the scrambler, the Ferris wheel and that crazy cage ride that made you tumble round and round inside little buckets while the whole structure rotated. And if that didn’t make you sick enough after consuming an overdose of cotton candy or funnel cakes, there was also the wall of death – which, with its drop-out bottom and g-force principal - doubled as a physics lesson. Another big attraction was the live entertainment, usually featuring immediately local acts, sometimes a high school rock band. Their efforts were much appreciated and their tunes – like “China Grove” and “Sweet Home Alabama”- rang through the city streets. 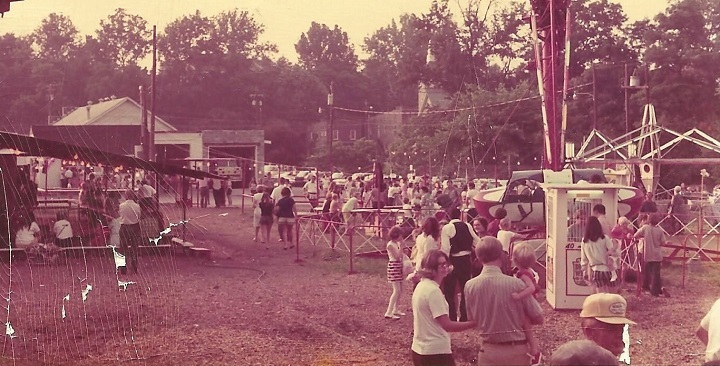 The days and weeks leading up to the fair were exciting too. Posters were all over town, as were canisters featuring the pictures of Fireman’s Fair Queen contestants. There were always a few in the window of the Dairy Queen and we’d make our daily jaunts from Bridgeport Pool to get ice cream, we’d always drop in some change. Whichever contestant gathered the most loot come fair time was crowned on the stage. The announcement was always much-anticipated. 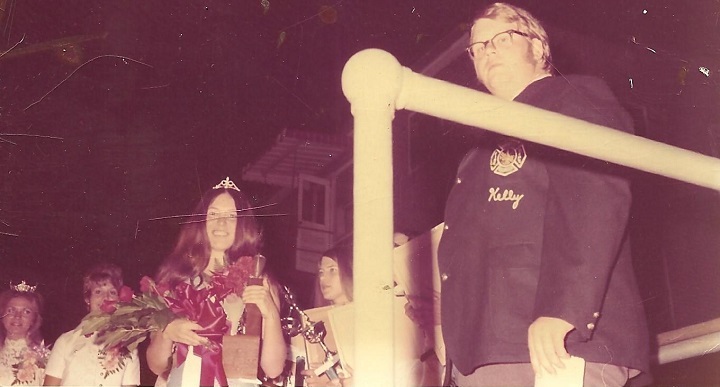 The contestants were all featured in the Fireman's Fair Parade, which also included the high school band, twirling groups and other hometown units. Wow; those are good memories. 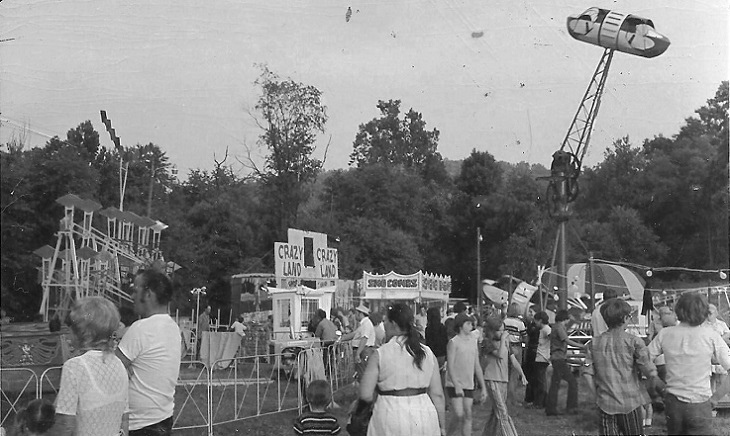 I was lucky to attend the fair several years while growing up and it stuck around long enough for my husband and I to take our own kids when they were little. In recent years, there have been revival attempts, but it just didn’t seem to stick. But hey, you never know. It could happen again.